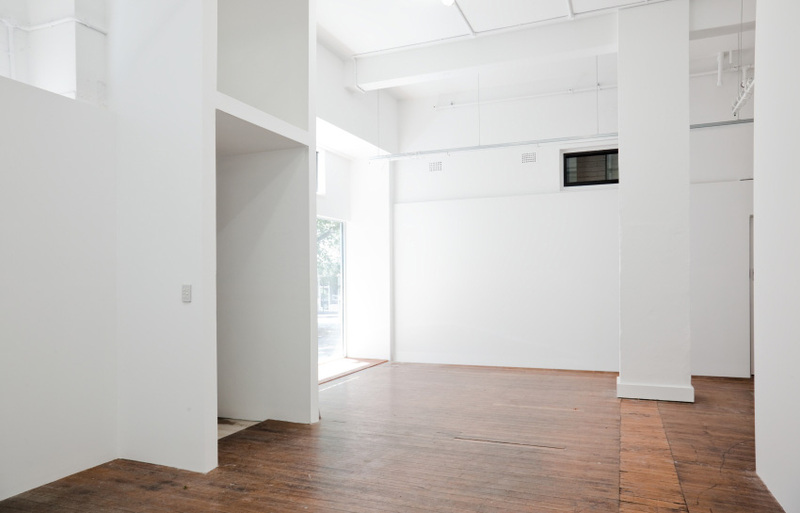 The Cross Art Projects is a not-for-profit curatorial initiative founded by Jo Holder in September 2003 and run by a small group of independent curators. 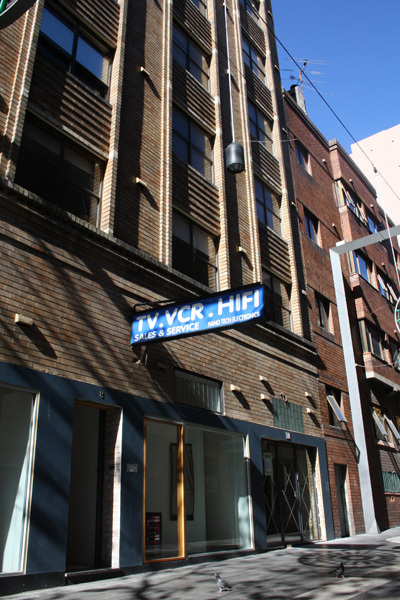 In late 2009 we moved to 8 Llankelly Place after working at 33 Roslyn Street in Kings Cross in tandem with The Cross Books. 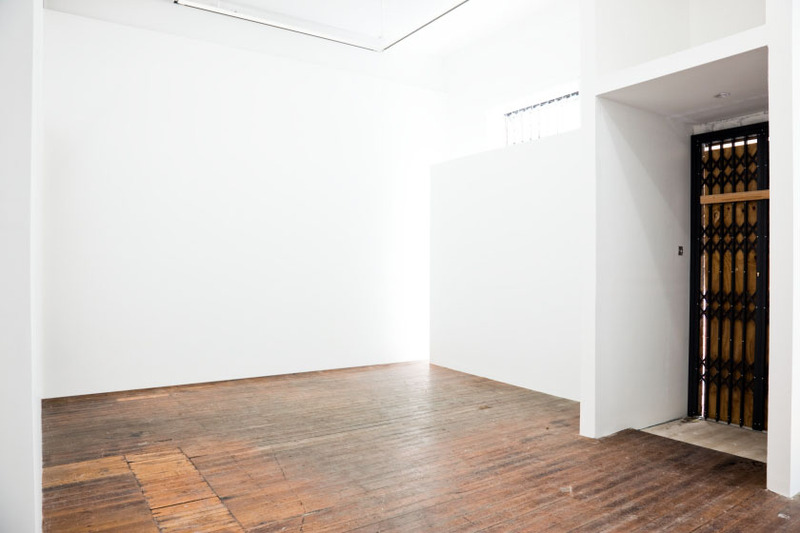 The old space continues as a curator run-space with changing formats every two years. (Formerly The Drawing Room now Affiliated Text). Manifesto: The Cross Art Projects foregrounds contemporary work that reflects the multiple relationships between art and life, art and the public sphere and explores the boundaries of this context. We are attentive to the local without sacrificing the scope of an international view. The Cross Art Projects presents curated exhibitions and work by artists who create critical projects that question and/or reflect our present circumstances and whose work has a rigorous conceptual foundation. Projects are enhanced with conversations and round-tables by local activist, architectural and heritage groups. 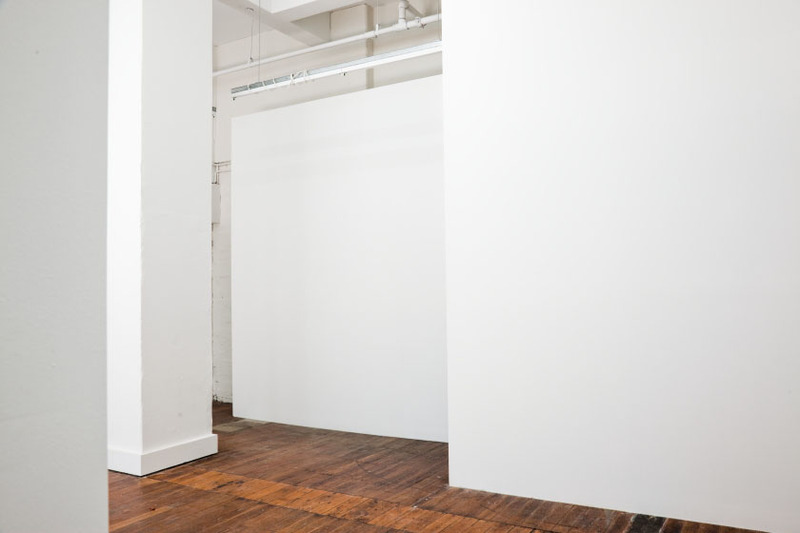 Artist in Residence: A short-term place-specific residency. Jo Holder is a curator and writer who works with contemporary artists, scholars and activists both inside and outside gallery contexts, in communities and in public spaces. She is director of The Cross Art Projects in Sydney. She is co-convenor of the independent research cluster Contemporary Art and Feminism (with Jacqueline Millner and Catriona Moore) and produced the year-long Future Feminist Archive (2015–16). 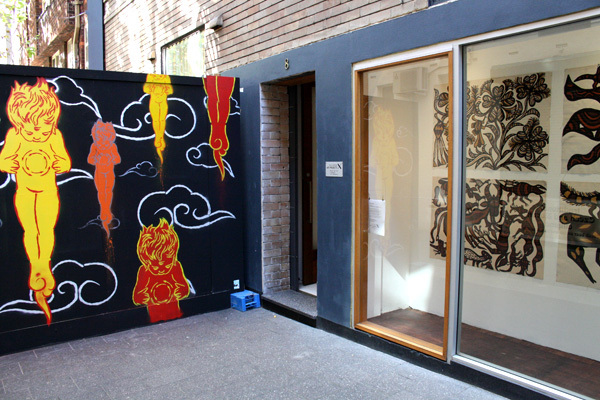 Her curatorial projects often engage with equity and justice issues such as Elastics: Darwin<>Sydney<>Dili (2014, Chan Contemporary Art Space, Darwin) and Green Bans Art Walk (2011, Performance Space Walks series, Sydney). She has held professional roles in the arts for over four decades: as director of SH Ervin Gallery, National Trust, Sydney (1997–1999), co-director, Mori Gallery, Sydney (1984–92) and teaching and writing on the visual arts. A former Australian Financial Review art critic, she has published numerous essays and articles and edited many visual arts publications. She was co-editor with Joan Kerr of Past Present An Anthology on the National Women’s Art Project (1997) and Joan Kerr, A Singular Voice: Essays on Australian Architecture (ed., Candice Bruce, Dinah Dysart and Jo Holder, 2009). For the twentieth anniversary of International Women’s Year, she coordinated the National Women’s Art Exhibition comprising simultaneous exhibitions in over 300 galleries, museums and libraries (1995). She is co-author of Human Scale in Architecture. George Molnar’s Sydney (Thames and Hudson, 2003). Curator and writer Djon Mundine's eminent career includes the TarraWarra Biennial 2014, Whisper in My Mask (co-curated with Natalie King). His much awarded Bungaree: The First Australian, an exhibition and catalogue of commissioned artworks by sixteen NSW Aboriginal artists for Mosman Art Gallery is touring nationally (2015–16). Djon Mundine is a foundational figure in the criticism and exhibition of contemporary Aboriginal art. He co-curated (with Fiona Foley) Tyerabowbarwarryaou — I Shall never Become a Whiteman, Contemporary Aboriginal Art for the 1994 Havana Biennale and Sydney's MCA and was a curator for Aratjara exhibition (Dusseldorf, London, and Denmark, 1993–94). Other triumphs include They are Meditating: Bark Paintings from the Museum of Contemporary Art's Arnott's Collection (2008) and The Native Born (1996) also for the MCA, an exhibition and publication showing ceremonial and utilitarian weaving and artistic work from Ramingining community. This led to the inclusion of artists such as Robyn Djunginy in the 1998 Sydney Biennale and in biennales worldwide. Djon Mundine was art and craft adviser / curator in the proudly traditional Aboriginal communities of Milingimbi in 1979 and Bula-bula Arts in Ramingining in Arnhem Land for sixteen years. Here he originated Australia’s greatest artwork, the Aboriginal Memorial, comprising 200 painted poles by forty-three artists from Ramingining, each symbolising a year since the 1788 British invasion. The Memorial was central to the 1988 Biennale of Sydney and is on permanent display at the National Gallery of Australia. He has held senior curatorial positions at the National Museum of Australia, the Museum of Contemporary Art, Sydney, Art Gallery of New South Wales and as curator Contemporary Art at Campbelltown Art Centre. In 2005–06 he was resident at the National Museum of Ethnology (Minpaku) in Osaka, Japan as a Research Professor in the Department of Social Research and is a PhD candidate at National College of Art and Design, University of NSW. Jasmin Stephens is a Sydney-based curator, educator and project manager who has worked across exhibitions, collections and public programs. Her experience is Australia-wide and in Asia and she has curated over 70 exhibitions and hundreds of events. From 2006-10 she was Curator/Exhibitions Manager at Fremantle Arts Centre, Perth, and prior to this, Senior Manager, Education and Access, with the Museum of Contemporary Art Australia and Client Services Manager with Artbank. Her recent exhibitions include far and wide: Narrative into Idea, UTS Gallery, University of Technology, Sydney (2014); Collection+: Pinaree Sanpitak, Sherman Contemporary Art Foundation, Sydney (2014); and My Sisters and other Ghosts: Genevieve Chua, Imhathai Suwatthanasilp, Bussaraporn Thongchai, The Cross Art Projects, Sydney (2015). In 2014 she also worked with artist David Haines as a curatorial participant on Kuandu Biennale at Kuandu Museum of Fine Arts in Taipei in association with Asialink. A regular panel assessor, exhibition judge and mentor, she has recently written for Art Monthly Australasia, ArtAsiaPacific and Artlink. Proposals for exhibitions are invited from professional curators and should be consistent with the gallery’s curatorial policy with work of the highest quality. • Provide opportunities for collaborations with other cultural organisations, funding agencies and sponsors. 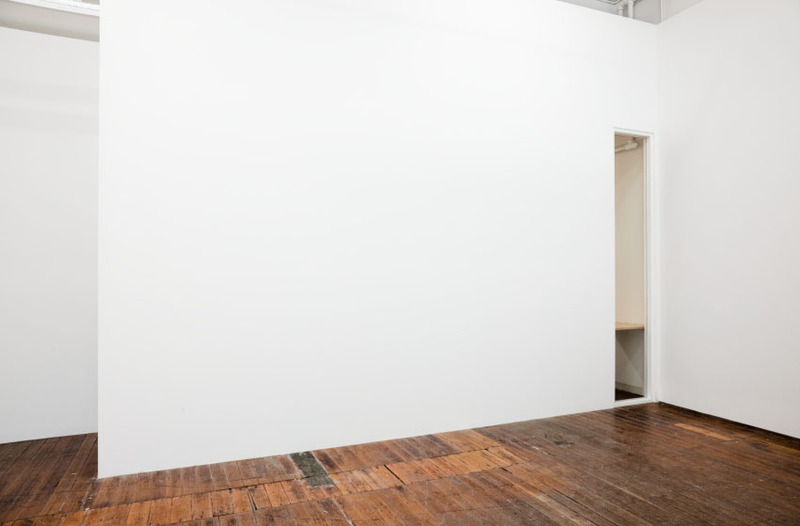 Curatorial submissions: are reviewed every 3 months. • Preferred date of the exhibition or project. The new space in Llankelly laneway. Adjacent are other significant local residential flat buildings: Walmur by Emil Sodersten, Regents Court and Sandringham by Claud Hamilton, Gowrie Gate by Dudley Ward and Franconia by Leslie Nelisen who also designed the west side of Springfield Avenue (State Heritage Register). The reigning architectural glory is the Minerva (now Metro) Theatre and 2KY Radio building by Bruce Delit. Narrow Llankelly Lane (just 6 metres across) links these special places and buildings. 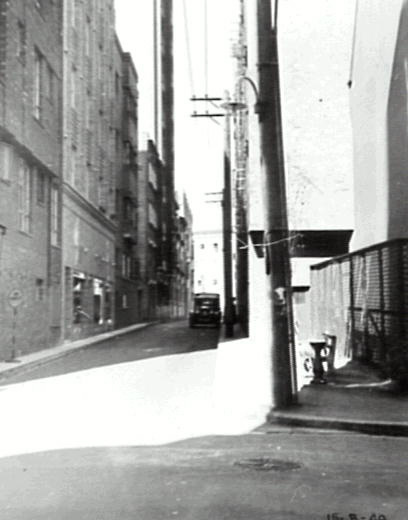 The lane was dignified with the name 'Llankelly Lane' in 1922, was renamed 'Llankelly Place' in the late 1980s after City Council acquired privately owned sections of the laneway, Springfield Avenue (renamed Springfield Mall) and garages on Orwell Street to create Springfield Gardens. The Mayor Doug Sutherland opened the gardens in 1986 (plaque). In 2000-2003 architect Peter McGregor redesigned Llankelly Lane and Springfield Mall. His lightwork and pavements have become quiet local place markers and a sensitive evocation of a European style pedestrian lane. The lane is a special place, with a Local Recreation Reservation (Zoning Control No 9(c) South Sydney Council Local Environmental Plan 1998. Residents are fighting to protect the area's fine-grained residential and mixed commercial character, under threat from commercial 'activation' and a high rent monoculture. Llankelly Lane (rear of Cahors Building), 2007: derelict 'TV .VCR. HIFI' repair shop. Llankelly Lane the finish of a Green Bans Art Walk, 2011. Llankelly Lane Art, Jason Wing and Mini Graff, 2011: "temporary" hoarding placed outside The Cross Art Projects for 8 months. Council then demanded a development application for the hoarding artwork. Running along Llankelly laneway between Darlinghurst Road and Orwell Street in Kings Cross, are 11 suspended lights ('roundells'): red lights mark the entrance to Darlinghurst Road, transitioning in the middle from orange to yellow to green for the residential flat buildings where the lane meets the trees of Springfield Park on Orwell Street. Architect and artist Peter McGregor was inspired by nearby El Alamein Memorial Fountain. McGregor's design ensemble — lightwork, paving and the more subtle Springfield Mall—suggest the fine grain of interconnecting European lanes. Together they create a handsome addition to a Heritage Conservation landscape liking a lane to a public park. 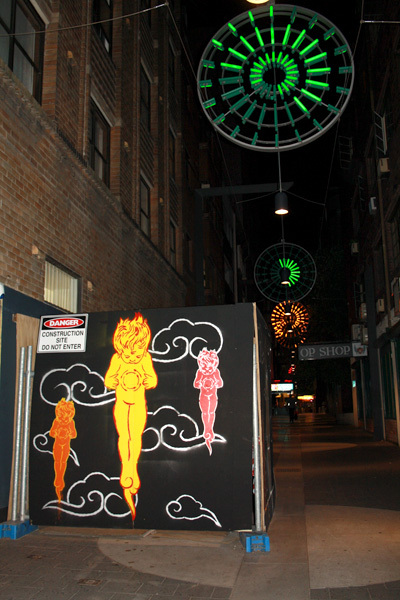 Artwork commissioned and installed by South Sydney Council in 2001. The lightwork is designed to not detract from the area's residential amenity: the colours are laid out in a spectrum array from red to yellow to green at the Springfield Gardens end. 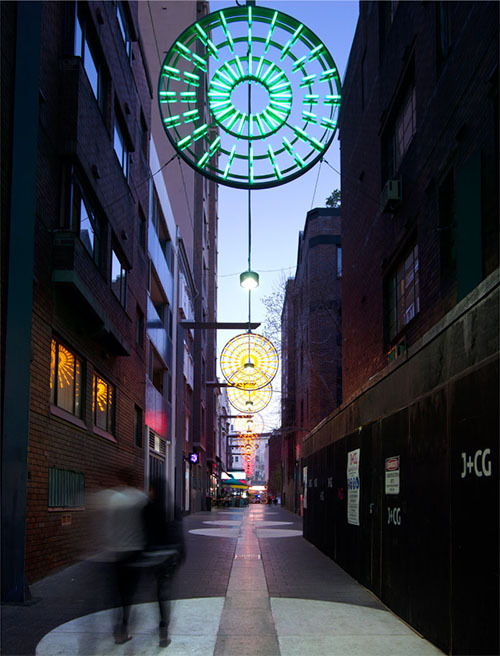 An active program dims each light on and off, at the average pace of a person walking — as the light sequence shifts from red near Darlinghurst Road to yellow then to green at the high density residential end of the lane. 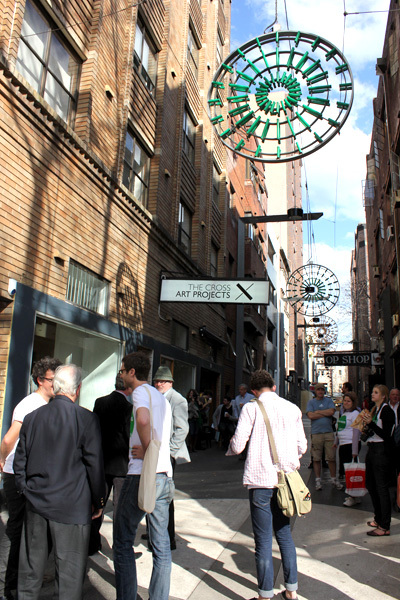 The Art Deco Society has called for the Kings Cross district to be declared an Area of National Significance. Over the twentieth century, artists and writers have celebrated neon as the colours of the street, from poet Kenneth Slessor’s Darlinghurst Nights (1933) to Baz Luhrmann’s film ‘Strictly Ballroom’ (1992). In 2004 a fierce local campaign saved the neons from being pushed into a "standard design template". 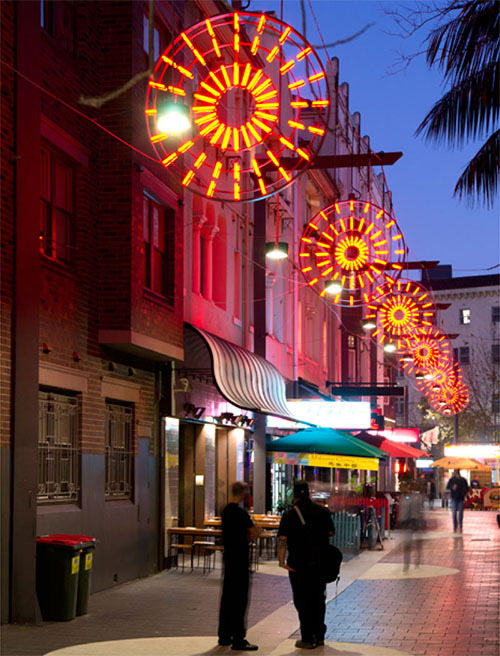 After lobbying by the National Trust (NSW), Council announced that Darlinghurst Road was a unique neon precinct. Thanks Art Deco Society, National Trust and all heritage bods for the helping interventions along the way. Thanks to those who joined the 'just fix the lights' case. After so much investigating, reporting, tendering it is wonderful to see the lights home. The Llankelly lights were reinstated on 29 May 2013.